I am always on the look out for quick and easy meals that keep dinner interesting. I have my favorite stand-bys like spaghetti and turkey burgers but I like to throw in something different into the rotation. This soba noodle stir fry is that kind of recipe. If I've said it once, I've said it a thousand times - stir frys are a great way to use up odds and ends in the fridge. You can make a stir fry with just about any combination of vegetables and protein. This recipes happens to be one of my latest creations so don't feel like you have to stick with this exact ingredient list. Also, if you cannot find soba noodles (a Japamese buckwheat noodle), substitute with whole wheat spaghetti. Step 1: Fill a large pot with water and place it on the stove top to boil. Cook soba noodles according to package directions. Step 2: Heat vegetable oil in a large skillet or wok over medium high heat. Add the garlic and ginger and cook until fragrant, about 30 seconds. Add the bok choy, bell pepper and carrot and continue cooking until vegetables have softened, about 5 minutes. Step 3: Meanwhile, in a small bowl combine soy sauce, shaoxing wine, oyster sauce, sesame oil and cornstarch. Whisk ingredients together until well incorporated. Add the slurry to the vegetables until sauce becomes slightly thickened. Step 4: Drain the cooked noodles and add to the vegetable mixture. Toss the noodles until coated with the sauce. 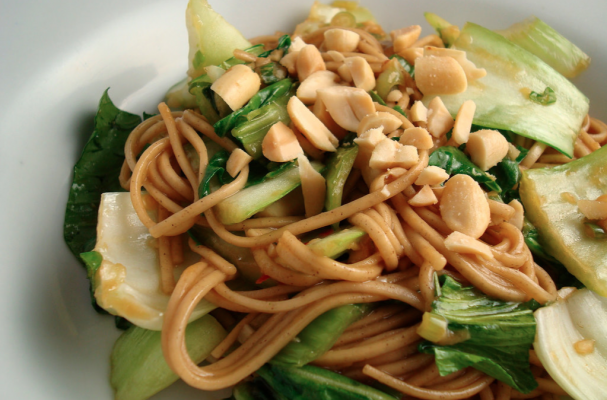 Garnish with green onion, sesame seeds and chopped cashews. Serve hot.